I have MMD, what other programs should I own? Do I need other softwares to go with MikuMikuDance? 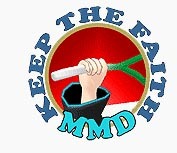 What programs will make MMD easier for me? dA’s Trackdancer talks about his new video and has some suggestions for “must have” software for MMDers! Those of us who know Trackdancer on Deviant Art know that he enjoys using this little Chibi IA as his mascot… so cute! Can a chibi character be used to deliver a serious ‘diva-style’ performance? The results can be seen in my new video and you will have to judge for yourselves how well this was pulled off, but I will say that I’ve learnt a lot doing this, especially what you can and what you can’t do when using this type of character. In carrying out this project I actually had to throw out several hours of custom animation work, because half way through I realized my original assumptions and methods were wrong for the character type. I hope you enjoy the little video! 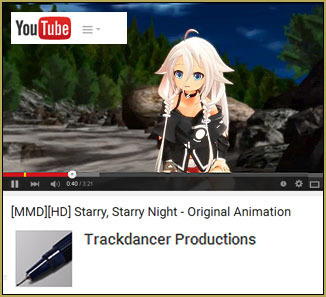 Trackdancer continues… Making original animations and videos for MMD is a big learning experience, but very rewarding. Personally I like pushing things to the limit and exploring new territories and with software like the ones listed below (and all for free I might add) this brings very exciting advance technologies to the average user making possible very polished results for negligible costs. ►PMD or PMX Editor – stuff does need to be ‘adapted’ for video productions sometimes and this software is invaluable for this. ►AviUtil or equivalent (Adobe After Effects) – must have for adding titles, special effects, transitions, etc. Adds that ‘pro’ touch to your videos. When you get there, Download the Japanese version 100… and unzip it on your desktop. 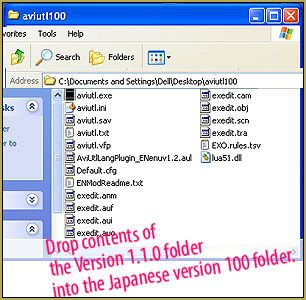 Now download the English plugin Version 1.1.0 … unzip it, and drag and drop all of the contents into that first Japanese version folder… say OK to let a new file replace an old file… now, when you open aviutl.exe, it opens as the English version. The AviUtil software is neither intuitive nor user-friendly to begin with, but it doesn’t take long to figure out the basics and once you’ve got that done, you’ll find that it’s got some real power under the hood. Easily competitive with expensive commercial equivalents like After Effects except for it’s rather lame UI… User Interface. ►Photoshop or equivalent for creating titles, etc. GIMP http://www.gimp.org/downloads/ is great if you want a free program with equivalent capabilities. Whatever you use, especially if you’re using AviUtil as well, must be able to properly process PNG graphics with transparencies. ►A decent codec -I use the Xvid codec from Xvid.org. It’s free, superb and easy to use and integrates seamlessly with MMD and AviUtil. I can’t emphasize how important this is especially for media intended to be uploaded to a streaming service like YouTube. YouTube DOES reprocess everything you upload, so it is best to optimize your media for this processing so as to minimize loss of quality. A good selection of useful MMEs is almost mandatory these days. These are the resources that I regularly use. BTW, you don’t need to have a PC with the greatest specs to make top notch videos. Most PCs and laptops made within the last 10 years can do the job as long as they have a decent graphics card and adequate memory (RAM).